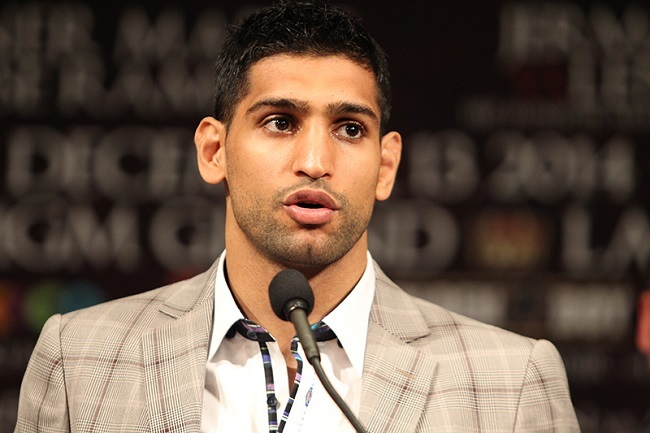 Amir Khan, the reigning WBC Silver Welterweight champion and 2014’s British boxer of the year according to at least one columnist, has become the world’s most outspoken Muslim athlete on the topic of Islamic extremist terrorism. A few weeks ago, Khan visited the school in Peshawar, Pakistan, where Taliban gunman killed approximately 150 people (most of them students) on Dec. 16, 2014. The two-time world champ used that trip to announce that he will be building a boxing academy in Pakistan, and called on the country’s leaders to help eliminate terrorism by promoting education and sports to the Pakistani youth. This week, in the wake of multiple deadly attacks in France — including one at a magazine office in which a Muslim policeman was among the 12 people killed by gunmen claiming affiliation with Al-Qaeda — Khan delivered a message to British Muslims in his home country to educate their kids about the evils of radical Islam. “I am a British Muslim and I follow the teachings of the Quran,” Khan is quoted in the UK’s Mirror. “One of the things it teaches is not to harm other people. What we have seen happening is wrong. I don’t know where they are getting it from. It is up to British Muslim parents to stop their children joining up to these beliefs. While it really shouldn’t fall on the shoulders of Muslims around the world to answer for the violent crimes of individuals and groups who claim to follow Islam, it has now become routine for each incident of terrorism to be followed by calls for uninvolved Muslims to condemn and denounce those crimes. And while thousands, sometimes millions of Muslims do oblige those requests every time, there are always going to be ignorant folks and media trolls who say they don’t see or hear any denouncements or condemnations. If more high-profile public figures like Amir Khan continue to be outspoken on the topic, it will be harder and harder for those who claim deafness and blindness to deny the truth.